Ever wondered what it might be like to take part in a riot, organising gangs to basically fight the police? Wonder no longer as that is exactly the idea in Riot: Civil Unrest. Featuring “real world uprisings” my initial reaction was one of questioning if this is a little bit bad taste. 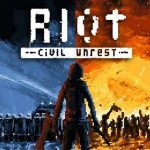 The creator experienced the NoTAV riots in Italy first hand and wanted to create the game to express the feelings associated with such events. I imagine being part of one of a real-life riot is an absolutely terrible thing. What Riot: Civil Unrest does, however, evoke feelings of playing a fairly crap RTS. The concept is that either controlling the rioters or the police, you move groups from point A to B and perform an action when you get there. You can get your group to act more aggressive, throw things, or charge into the opposition. Before you begin there is actually quite a lot of options. On starting the story mode, the first level is the aforementioned TAV riot – incited by the Italian government building a high-speed train route, costing billions and damaging the environment significantly. The idea of giving you some background to these events is actually good and well executed. It feels like it’s really trying to help inform you about these events. It’s a shame then that the execution doesn’t really follow. On starting a level you get to choose ‘equipment’ which can range from boosting your cause on social media to more rocks in backpacks to resistant to smoke grenades. Once you start though it just feels chaotic. Shoulder buttons switch between your groups and they move a bit like unwieldy Pikmin. The group reacts to objects and moves around them but sways and pulls in various directions. The pixelated art style doesn’t really help and it all just feels a bit unclear who is moving where. The direction and face buttons to use your abilities and to up things like aggression are also a bit confusing. No resources are here, just cooldowns on abilities and I often found myself just mashing buttons in frustration to either stop the looters or stop the police from destroying my riot camp tents. There is some finesse to throwing things like Molotov cocktails. A simple aiming circle appears which lets you position and target projectiles. It adds a needed layer of depth to proceedings but it isn’t really enough to shake the chaotic feeling. Maybe that’s the point. Riots after all, by their very nature, are chaotic. With other major levels set in Spain (Indignados), Egypt and Greece there is an important point to this. Or rather reference to, as Civil Unrest stays clear from subjecting you to a political message here. Maybe that’s for the best. If you’re interested in the game it’s really a jumping off point for learning more about historic riots. The gameplay won’t keep you.